In our presenter’s experience, commemorative events like funerals, memorial services, and celebrations of life serve to “jump start” the grief process for mourning families and communities. In both his clinical practice and his academic research, he has found great benefit to utilizing what he has come to call the five “anchors” of funeral ceremonies that unite humans across millennia and cross-culturally. 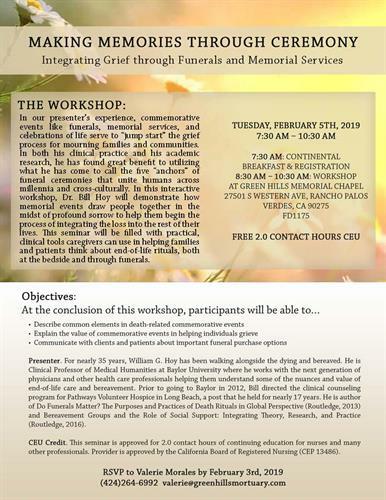 In this interactive workshop, Dr. Bill Hoy will demonstrate how memorial events draw people together in the midst of profound sorrow to help them begin the process of integrating the loss into the rest of their lives. This seminar will be filled with practical, clinical tools caregivers can use in helping families and patients think about end-of-life rituals, both at the bedside and through funerals. Presenter. For nearly 35 years, William G. Hoy has been walking alongside the dying and bereaved. He is Clinical Professor of Medical Humanities at Baylor University where he works with the next generation of physicians and other health care professionals helping them understand some of the nuances and value of end-of-life care and bereavement. Prior to going to Baylor in 2012, Bill directed the clinical counseling program for Pathways Volunteer Hospice in Long Beach, a post that he held for nearly 17 years. He is author of Do Funerals Matter? The Purposes and Practices of Death Rituals in Global Perspective (Routledge, 2013) and Bereavement Groups and the Role of Social Support: Integrating Theory, Research, and Practice (Routledge, 2016). CEU Credit. This seminar is approved for 2.0 contact hours of continuing education for nurses and many other professionals. Provider is approved by the California Board of Registered Nursing (CEP 13486).